I have always wanted to be able to say, “I’ve been to Graceland.” Cathy, Courtney, Maureen (my bffs) and I can now say that. We listened to an audio tour of the home as we wandered through room after room of shag carpet and 70’s kistch. It was interesting, yet somewhat sad and exhausting. 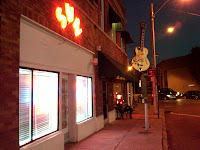 On the way back to the hotel, our shuttle stopped at Sun Records. At this point, the four of us were ready for more comfortable shoes and a plate of BBQ. Our shuttle driver nudged us off the bus and said, “I promise you will enjoy this.” We shuffled in, bought our tickets and fingered the overpriced Sun Records merchandise while waiting for the tour to begin. In walked Cora. She looks like a rocker chick – deconstructed tshirt, blond hair, jeans and rough-rider boots. She trained as a classical pianist for 18 years. And you could feel it…she digs music and musicians. She shared the oral tradition of Sun Records, a powerful vortex of rock ‘n’ roll history. She punctuated her stories with perfect tidbits of music, “Hear that piano…that’s Ike Turner!” “Did you know Carl Perkins’ rendition of Blue Sued Shoes out-charted Elvis’ version?” Cora demonstrated how Johnny Cash used a dollar bill wrapped around the neck of the guitar to simulate a drum sound when no drums were available in the studio. “By the way, I also accept tips,” she added as she unwrapped the bill. It was the power of her passion that moved us, energized us. I was moved to tears and laughed out loud. I got goosebumps as she listed about 101 artists who had recorded at Sun Records. Bono! Beck! Mick! We listened to a rare recording of Elvis jamming with Roy Orbison and Carl Perkins and Jerry Lee. Goodness gracious! If you are going to do something…go all out. Play from your heart and pull from your passion. Cara, hats off to you, girlfriend. If you are ready to tap into your passion, you may be ready for the Step by Step Success program. Al Levi and I will be chatting it up on BlogTalk Radio Tuesday, Nov. 10th at 3 pm central time. Doing what you LOVE makes making money so much easier.